Beyond Blush: Collective Beauty Haul! I made my first order from Sigma! I made an order on Black Friday when they were having their sale, and I ordered the Mr. Bunny Travel Kit. I ordered one for myself, and one for my boyfriend's mom for Chistmas. In addition, I ordered the F86, since it's been on my wishlist for quite a while. I already own the F80, which I won in a giveaway a while ago, and I absolutely love it. Also, if you order over $30 from Sigma, you receive a free gift, and I got the E05 eyeliner brush. 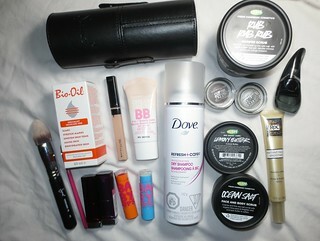 I've gone a little Maybelline crazy lately, I've just been loving a lot of their products! I've recently gotten two Baby Lips (Quenched & Cherry Me), two Color Tattoos (Tough as Taupe, Too Cool), two Color Sensational Lip Sticks (Red Revival, Blissful Berry), Dream Fresh BB Cream, and the Fit Me Concealer! Next up is Bio-Oil! I haven't started using this yet, but I've heard amazing things about it from friends, and from the blogging community. I can' wait to use this to battle dry winter skin, stretch marks, and scars. Dove Refresh + Care Invigorating Dry Shampoo - I have been loving this dry shampoo, I think it's much, much better than the one from Tresemme. I find that this makes my hair look and feel clean and refreshed. 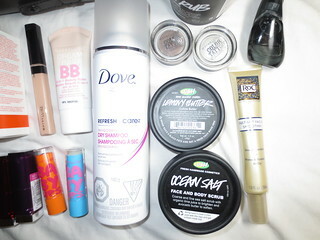 Next up, some Lush items! Lemony Flutter is an essential for me, especially in the Winter! My last tub recently ran out, so I needed another. And then I have two new scrubs from Lush: Ocean Salt and Rub, Rub, Rub. Both are amazing, but serve different purposes (Ocean Salt is coarser, and Rub, Rub, Rub actually creates a beautiful lather!). ROC Instant Facial Smoother - I was in need of a new primer, and this one caught my eye! I've been using this for a few weeks now, and I really quite like it. I find that this product creates the perfect canvas to apply foundation over. Donna Karan Woman Perfume - I received this deluxe sample from Sephora. Make sure you receive emails from Sephora, because they always are giving out great deluxe samples! You got a lot of great products! 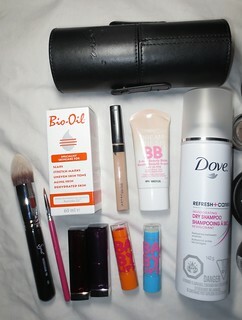 I love Ocean Salt, Maybelline FitMe Concealer and their BB Cream! Okay, I'll definitely share what I got for Christmas!